Order Woodforde Nelson's Revenge 40 pints from the Stirling Homebrew Shop UK. 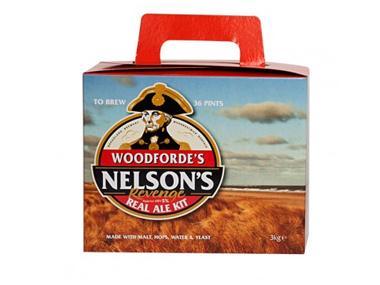 Buy Woodforde's Real Ale Kit - Nelson's Revenge 40 pints and other Beer Kits & Cider Kits safely online in the UK. This ale kit creates a tasty ale with a pleasing aroma of malt and and rich fruit with citrus notes. The palate is full, with malt and fruit dominating initially, but giving way to a lingering dry finish. This Nelson's revenge ale kit creates a tasty ale with a pleasing aroma of malt and and rich fruit with citrus notes. The palate is full, with malt and fruit dominating initially, but giving way to a lingering dry finish. Woodforde wherry bitter real ale kit has been produced using only the finest ingredients and is based on Woodforde's original grist formulation. Made with the brewery's own choice of hops, the beer you brew will compare most favourably to its commercial equivalent. Our UK Homebrew Shop sells real Woodfordes and other Beer Kits & Cider Kits safely online to customers throughout the United Kingdom in England, Wales, Scotland and Northern-Ireland. View more products on the Stirling Homebrew Shop from Woodfordes. Where to buy Woodforde Nelson's Revenge 40 pints safely online? Shop at the Stirling Homebrew Shop if you are wondering where you can buy Woodforde's Real Ale Kit - Nelson's Revenge 40 pints safely online in the United Kingdom. Woodforde Nelson's Revenge 40 pints - Woodforde's Real Ale Kit - Nelson's Revenge 40 pints in Beer Kits & Cider Kits and Homebrew.